Share the post "How to Stop Dog Poop Accidents – Top 5 Mistakes Dog Owners Make"
How to stop dog poop accidents is one of the biggest dilemmas facing dog owners. I know for me, as a dog owner, I couldn’t get my Lily to stop pooping in the house, especially after she marked her territory. I dreaded slipping and falling into a puddle of pee. But what was I doing wrong? I’ll show you the top 5 biggest mistakes you’re making and then I’ll show you how to stop dog poop accidents in your home. If you’re anything like me, you’re so excited about having a cute cuddly puppy in your home. You want to make her feel welcome. The last thing you want to do is give her a strict schedule because you think it’s cruel. On the contrary. You have to put your dog on a strict schedule if you want to learn how to stop dog poop incidents in the home. It’s easier than it sounds. I’ll give you an example of a schedule you can follow later in the article, but for now, just know that you need a schedule. I forgot to take into account my lifestyle before I adopted Lily. I was rarely home. Certain house training methods work better than others – depending on your lifestyle. If you’re never home, how can you stop dog poop accidents? You can’t – and neither could I, which brings me to the next mistake. I didn’t know there were different housetraining/potty training methods based on the lifestyle a dog owner leads.The direct method is best used for the puppy owner that owns a house and has access to a backyard.I think the indoor potty training method is best for the dog owner who is busy at work. My next biggest mistake was that I was inconsistent with my dog and her schedule. Dogs need consistency. Sometimes I wouldn’t take her out until 2:00 p.m, other times at 4:00 p.m. I would feed her, but not on a strict schedule. If you want to learn how to stop dog poop accidents, you have to feed her and walk her on a consistent schedule. My next biggest mistake was that I inconsistently supervised her. A new dog needs constant supervision.You need to be able to sense the warning signals when she’s ready to go potty. 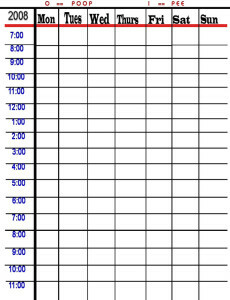 Setting up a regular feeding and walking schedule is the only way to know. Now that we know the biggest mistakes, I’m going to show you how to set up a dog schedule and how to stop dog poop accidents. This schedule is specifically for puppies, but adult dogs can use this same schedule with very slight moderation. 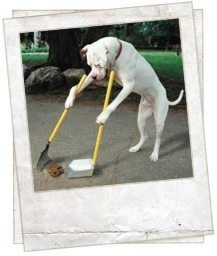 Remember, patience, consistency, and lots of praise will go a long way in training your dog how to stop dog poop accidents in your home. How helpful was this article? If this article was helpful, please feel free to visit http://www.trainjackrussell.com for my dog training tips and techniques.